Watch your earnings grow faster. 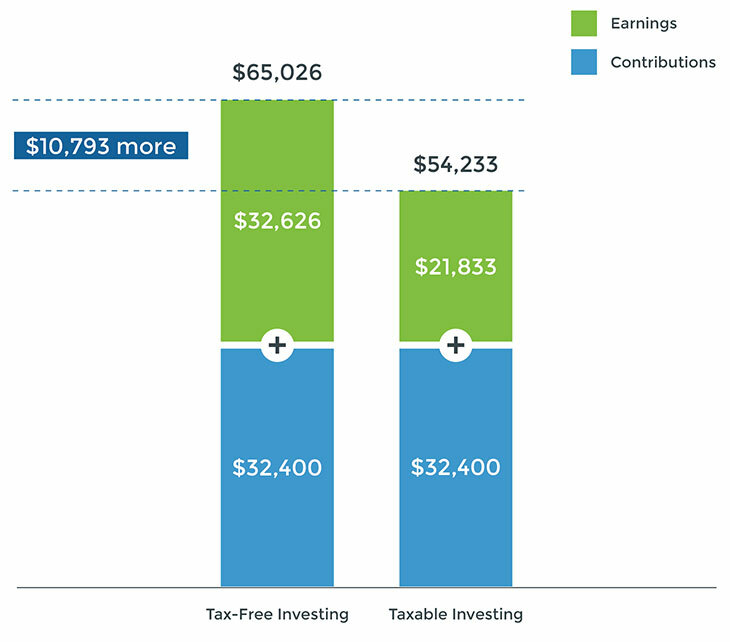 Regardless of your income or how much you can afford to invest, NEST gives your money a greater opportunity to grow with the help of tax advantages. Tax-advantaged savings result in your money working harder for you. How? Contributions to your NEST Advisor Plan account are made with after-tax dollars and your earnings grow federally and state tax-deferred while they're invested. Rather than paying taxes on the money you’re earning, it’s being reinvested. All of the investment growth is yours to use. Take into consideration state tax benefits. Nebraska account owners are offered significant tax advantages for investing in NEST, including an annual $10,000 income tax deduction. Get the details. *Amount assumes an annual investment return of 7% and monthly contribution of $150 per month for 18 years. This hypothetical is for illustrative purposes only. It does not reflect an actual investment in any particular college savings plan or in the NEST Advisor Plan or any taxes payable upon withdrawal. Keep in mind that this is a hypothetical example and its intention is to illustrate the difference between tax-advantaged and taxed accounts. Lower maximum tax rates on capital gains and dividends would make the return of the taxable investment more favorable, reducing the difference in growth. 1 Qualified higher education expenses include tuition, fees, textbooks, supplies, the purchase of computer or peripheral equipment, computer software, or Internet access and related services if used primarily by the beneficiary while enrolled at school, and equipment required for enrollment or attendance and certain room and board expenses for the academic term during which the student is enrolled at least half time at an eligible educational institution. Expenses for special-needs students that are necessary in connection with their enrollment or attendance may also be eligible. If you do not use the assets in your account for qualified expenses, the earnings portion of the withdrawal is subject to federal income tax and an additional 10% federal tax and may be subject to state and local taxes. 2 No additional contributions can be made for any beneficiary when the fair market value of all accounts maintained for that beneficiary within all programs offered by the state of Nebraska reaches $400,000. Assets can grow beyond $400,000.